With their arched ceilings, grandiose chandeliers and marble tiled walls, stations of Moscow metro are believed to be some of the most beautiful in the word. One of the most expensive projects in the Soviet history, the metro now has 206 stations, 44 of which are considered cultural heritage sites. Here are the most visually arresting metro stations that you should visit. One of the first Moscow’s metro stations, Park Kultury was opened on May 15th, 1935. Designed by Soviet constructivist architect Georgy Krutikov, the station was built using the cut-and-cover method. Since the excavation was made right at the Krymskaya Square, the station was to be named ‘Krymskaya’, but eventually they switched to ‘Park Kultury imeni Gorkogo’, and then shortened it to Park Kultury right before the 1980 Moscow Olympics. With its two rows of marble-covered columns, the station is famous for the 26 bas-reliefs, depicting leisure activities popular with Soviet youth like skating, tennis, dancing and even aeromodelling. Opened in 1938, Ploshchad Revolyutsii is a gallery of revolutionary characters, featuring 80 bronze sculptures, that, as rumour has it, work miracles if you touch them. Thus rubbing the nose of a border patrol dog guarantees an exam pass, while touching a shoe of the reading student girl is supposed to guard you from unrequited love. Behind every sculpture there is a real person with a unique story: Olympii Rudakovr, a naval cadet, who sat for the signalman sculpture, later became a rear-admiral and waltzed with Elizabeth II on the day of her coronation. The second largest metro station in Moscow after “Sparrow Hills”, the 220-meter-long Arbatskaya was completed in 1953. The Moscow-baroque-style metro station boasts unique design, that includes arched ceiling, exquisite bronze-framed chandeliers, ceramic bouquets and carpet-like marble floor. One of the world’s top 10 most beautiful metro stations, Kievskaya was commissioned by Nikita Khrushchev to celebrate the 300th anniversary of Russian-Ukrainian unity. Opened in 1954 the station is famous for its opulent decorations, magnificent chandeliers, large mosaics elaborately designed Soviet artist and rimmed with fantastic golden flowers. One of the oldest metro stations in Moscow, Mayakovskaya was opened in 1938 and won a Grand Prix at the 1939 World’s Fair in New York. The city’s main bomb shelter where Stalin gave a speech at the Moscow meeting of the Congress of Deputies in 1941, is famous for the mosaic ensemble “24-hour Soviet Sky”, that consists of 34 aviation-themed pieces created by Alexander Deineka. Opened during the World War II, Elektrozavodskaya is named after a nearby light bulb factory and you can clearly see the metaphor in the station’s state-of-the art lighting, that employs 318 lamps. The walls are tiled with Geogrian Salieti marble, as old as the early Jurassic period, and if you take a closer look, you’ll notice ammonite and nautilus shells. The visually stunning Novoslobodskaya station enthralls you with its 32 beautifully-lit stained glass panels, made of glass that had originally been meant for a cathedral in Riga. 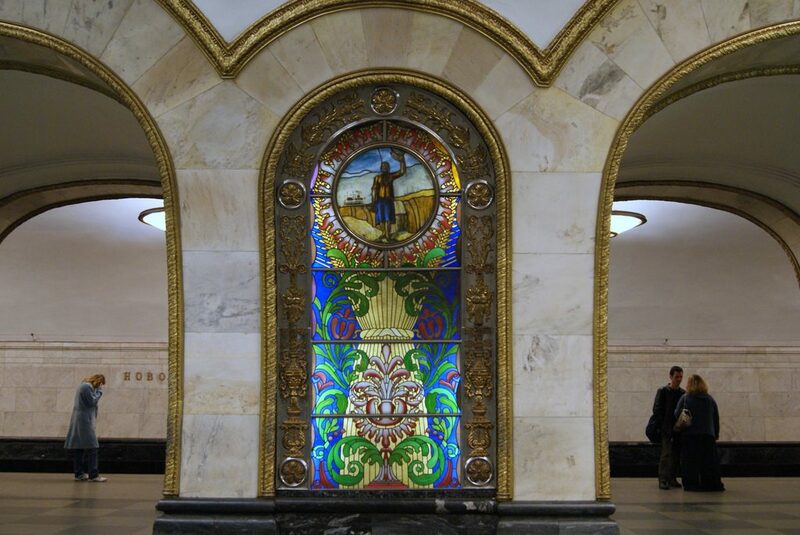 The mosaic centerpiece on the station’s side wall used to have a portrait of Joseph Stalin at its top, which was replaced with flying doves after his death when the cult of his personality was denounced.